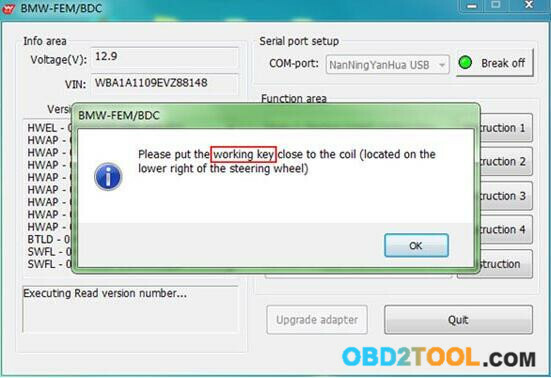 Here comes the easy step by step guide on how to use YH BMW FEM Programmer to add key for BMW FEM/BDC vehicle models. 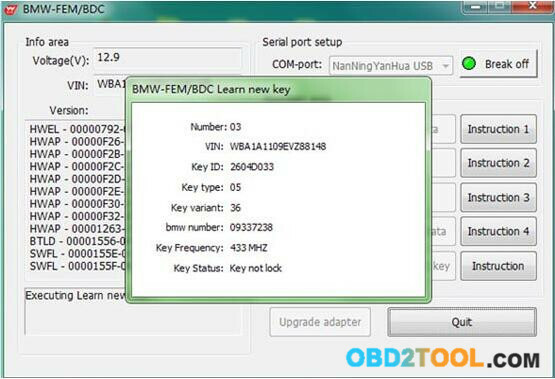 Connect the OBD2 socket of BMW FEM BDC to vehicle. 2 Turn on the ignition,keep the vehicle battery voltage on less than 13.0 V. Step 1:Backup(read) coding data Perform “Backup(read) coding data”,and save the data. 4 After data reading complete,save the data file on your laptop.The data file you saved is use for Step 4.Check the file data format,it is BIN. 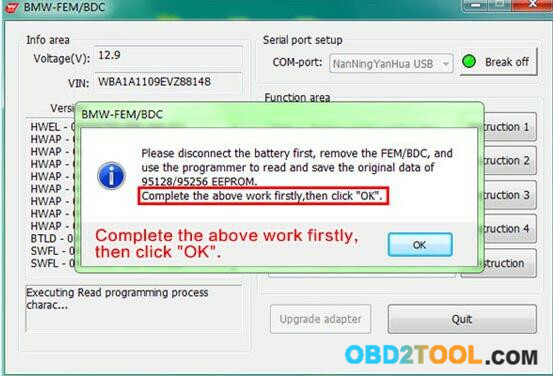 6 Software pop-up the follow tips,please follow instructions to disconnect battery and other charging device,remove the FEM/BDC,use car universal programmer(for example:YH CKM100) to read EEPROM data,save in BIN format in PC. 7 Remove the FEM/BDC. The FEM/BDC is located at the lower part of the A column at the front passenger side. Note:Disconnect the car battery and other charging equipment when removing and installing the FEM/BDC. 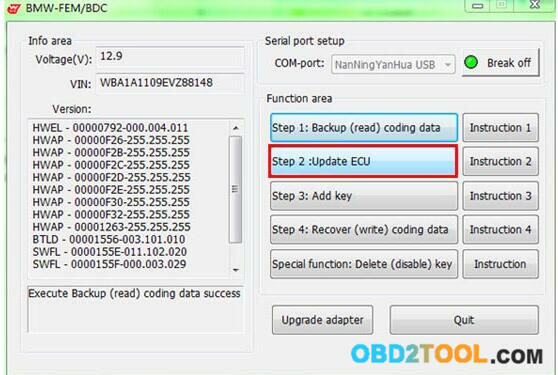 8 EEPROM position and pin direction 9 Please use car universal programmer,such as YH CKM100 to read out EEPROM data,and save the data file on your laptop. 10 After finishing above operations,please go back to the YH BMW FEM/BDC software interface and click “Ok”. 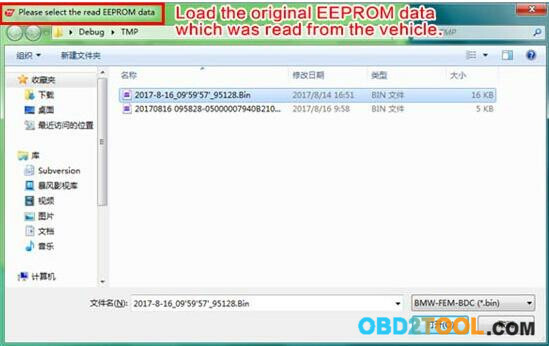 11 The software will prompt to load the original EEPROM data which was read from the vehicle by programmer. 14 According to the software prompt,put the working key close to the coil(located on the lower right of the steering wheel). 15 The software reads and displays the relevant information about the working key. Note:Keep the key close to the emergency starting antenna until the key information is reached. 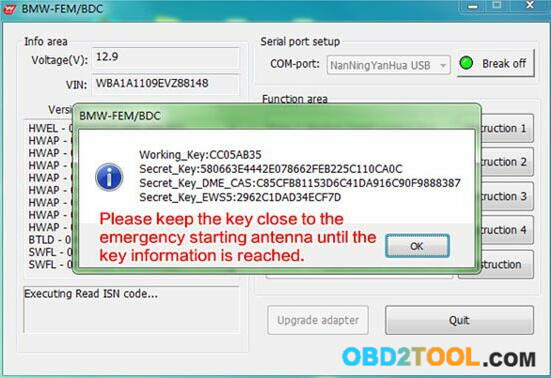 18 Key information will be showed after the new key is close to emergency start antenna. 19 After adding the key and learning,the software returns and refreshes the key list.Users can continue to add and learn more keys at this interface.If completed,click “Quit” Note:Please keep the key close to the emergency start induction antenna until the software pops up and refreshes the key list. 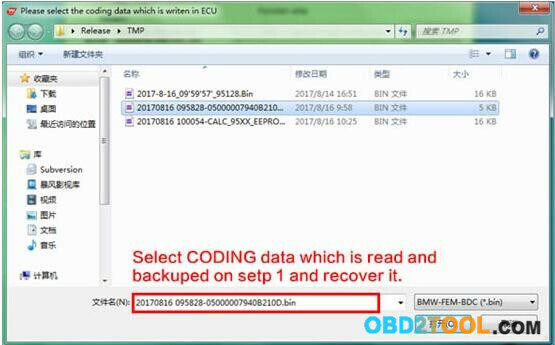 21 Select the first backup coding data of the vehicle,recover it. 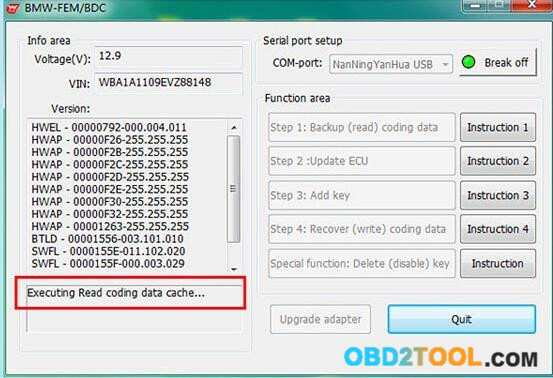 22 Successful recover coding data.Make full testing of vehicles and keys. 23 Test the remote control function of the key. Test the switch,engine start function of the key. Turn on the ignition,keep the vehicle battery voltage on less than 13.0 V.
Perform “Backup(read) coding data”,and save the data. After data reading complete,save the data file on your laptop.The data file you saved is use for Step 4.Check the file data format,it is BIN. 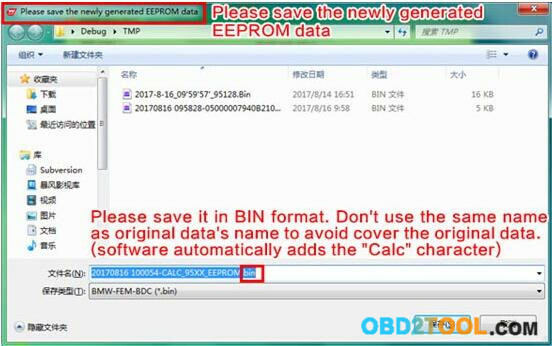 Software pop-up the follow tips,please follow instructions to disconnect battery and other charging device,remove the FEM/BDC,use car universal programmer(for example:YH CKM100) to read EEPROM data,save in BIN format in PC. The FEM/BDC is located at the lower part of the A column at the front passenger side. 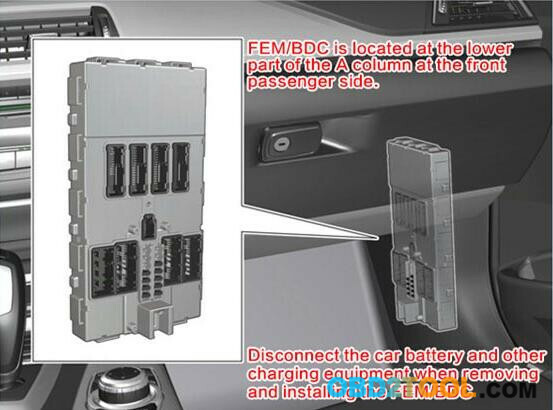 Note:Disconnect the car battery and other charging equipment when removing and installing the FEM/BDC. 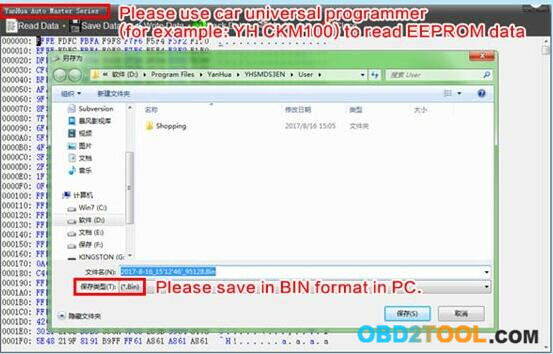 Please use car universal programmer,such as YH CKM100 to read out EEPROM data,and save the data file on your laptop. 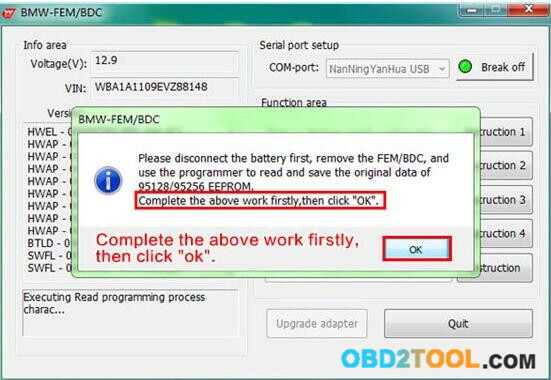 After finishing above operations,please go back to the YH BMW FEM/BDC software interface and click “Ok”. 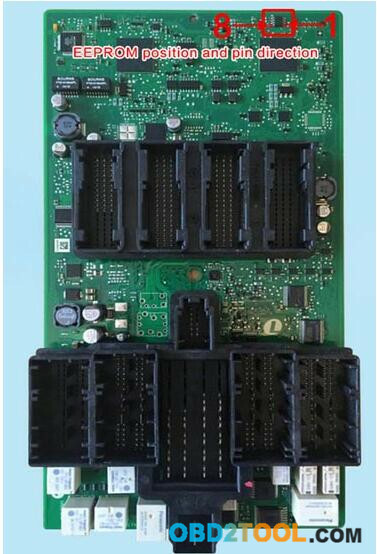 The software will prompt to load the original EEPROM data which was read from the vehicle by programmer. 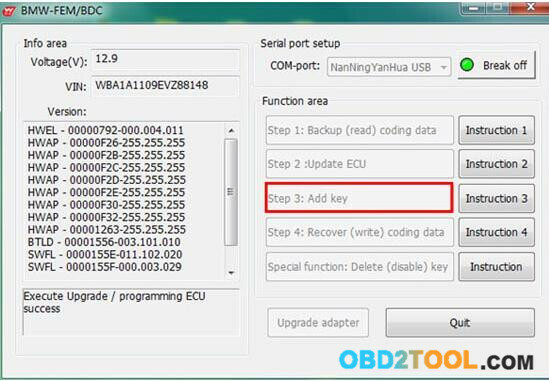 The software prompts to write the newly generated EEPROM data back to EEPROM chip.Solder the EEPROM back to FEM/BDC.Install the FEM/BDC back to vehicle.Recover normal power supply for vehicle and turn on the ignition. 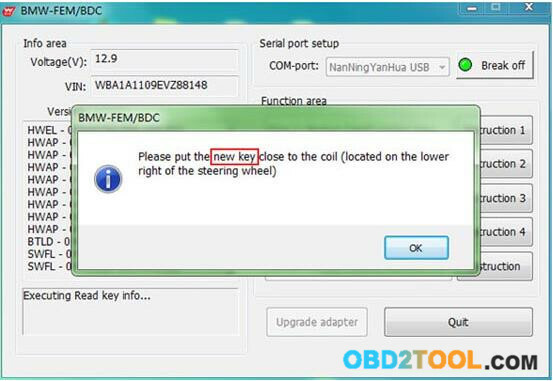 According to the software prompt,put the working key close to the coil(located on the lower right of the steering wheel). Note:Keep the key close to the emergency starting antenna until the key information is reached. Key information will be showed after the new key is close to emergency start antenna. Note:Please keep the key close to the emergency start induction antenna until the software pops up and refreshes the key list. 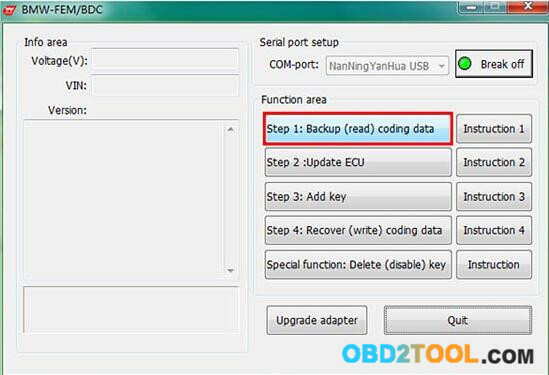 Select the first backup coding data of the vehicle,recover it. Successful recover coding data.Make full testing of vehicles and keys. Test the remote control function of the key. Test the switch,engine start function of the key. 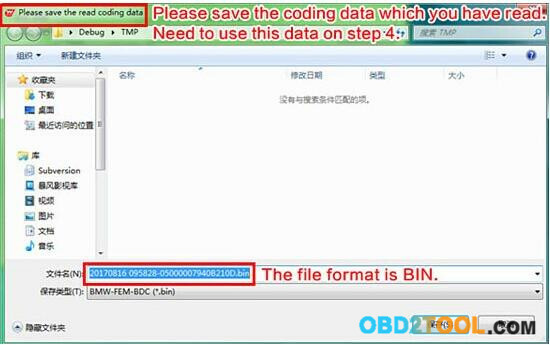 Posted in Auto key Programmer and tagged BMW BDC, BMW FEM Key Programmer, BMW FEM Programmer, BMW key programmer, MW FEM, Yanhua BMW FEM Key Programmer, Yanhua BMW FEM/BDC programmer, Yanhua BMW-FEM, YH BMW FEM Programmer.